Real name: Samuel Zarnocay Jr. 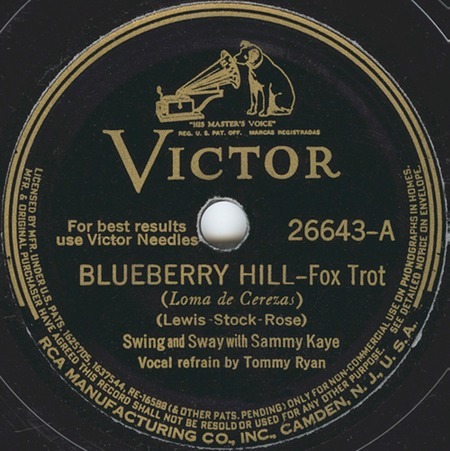 It was a close-run race in 1940 to see who was going to be the first to release "Blueberry Hill." Sammy Kaye won, releasing his recording on the last day of May. The following weeks saw releases by Gene Kruppa, Glenn Miller, and Kay Kyser. Russ Morgan's version was released in July and then came Gene Autry's in August, followed by still others later that same and following years. But the number is undoubtedly most associated with Fats Domino, whose 1956 version made it to the top of the R&B charts. Sammy Kaye, a clarinettist, led his own band in Cleveland and Pittsburgh before moving to the more lucrative hotel engagements of New York in the late 1930s. The critics disliked his simple style, but the patrons loved it. His band became popular on radio in the 1940s and made a successful transition to television in the 1950s.